I hope you enjoyed that commercial, now on to the article. In the last Best Game Ever, Pat covered Suikoden, his first RPG. I grew up watching my brother play games like Ys and Phantasy Star on the Master System and Times of Lore and Moebius (both by Origin) for the C64. Because of this, I never really had a “Eureka!” moment when it came to RPGs; they just always sort of existed. After racking my brain for memories, I think I’ve come to the conclusion that I played Phantasy Star 2 in ’89 and Dragon Quest in ’90 but still neither of them were my firsts. 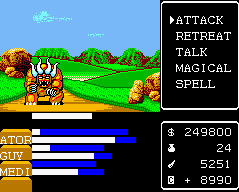 As far as I can tell, the slightly obscure Miracle Warriors for the Sega Master System has that honor. I find the enemy design to be particularly interesting since I’ve seen less inspired creatures in PS2 games. I suppose better graphics cards do little to change how creative an artist is. In all, there are about 75 different enemies and only about 3 of these are pallet swaps (and these all fit a motif — they are the guardians of Earth, Heaven and Hell). There are a few near pallet swaps but the designers were good enough to make minor modifications to the creatures besides changing their colors. Gameplay was pretty standard but had some odd differences I can only assume come from PC RPG influence (or maybe the designers were just creative…nah). 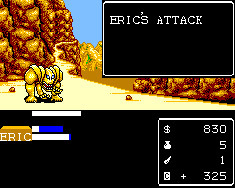 In battle, only one of your four party members attacks at a time and the enemy retaliates against that party member. This is sort of strange and almost makes it feel as if you have one party member who has three extra lives. After winning a battle, you receive money, fangs and character points. Experience is gained during the battle as you make successful attacks against the enemy, of which there are only ever one. Money is pretty standard, but the fangs you find from dead creatures can be sold or held onto as a war totem. In fact, certain quests can only be done by having enough fangs in your…fang pouch. Character points worked in a similar way in that you need a high rating in order to proceed at times. Killing particularly evil beasts scores a lot of character points but then you also encounter good people in your travels — kill them and you’ll take a hit to your character score. You are following in the footsteps of the ancient warrior Iason who sealed Pandora’s Gate some clichéd time ago, say 1000 years. Towards the end when after you’ve assembled the entire Napkin of the Ancients or whatever the thing is that has directions to the last boss, you get the piece of advice that Iason was twice as fast as other men. Without factoring this into your thinking, you would follow the directions on the Napkin and never find the final boss. 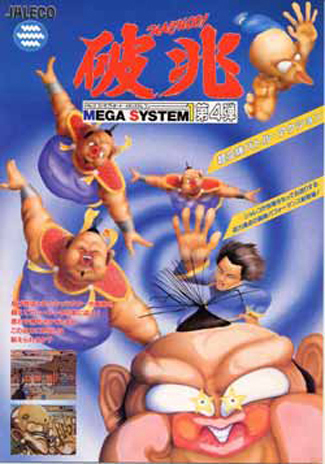 Miracle Warriors didn’t really have a magic system. There were a few items that could be used in battle but not a single spell. Also odd, weapons degraded over time and needed to be brought to a blacksmith to be sharpened. Finally, an item all games should have, there was the mantle, which prevented weak enemies from even attacking you. More interesting than my overly long description of the game mechanics is how the game is remembered. Titles like Miracle Warriors and Phantasy Star, with their more open ended adventure style, confuse newer gamers. The original copyright to the title is from 1986, which makes it only months older than Dragon Quest, the game which is erroneously given credit as being the first Japanese RPG. Someone smart once said that history is told by the winner. Dragon Quest apologists can be found at any gaming site. They’ll tell you the game was the first of it’s kind, is 20 years old, set the standards every RPG today uses. They’re right, but many of these same people do not acknowledge the other early stabs at Japanese RPGs. Dragon Quest’s mechanics and conventions still exist today because the game was a hit. Having to hire a blacksmith and talking to my enemies seems odd because the template that won back in the mid 80’s did not have these features. Old RPGs that are now seen as unplayable relics sadden me. They are paths down the RPG trail that are seldom explored because the genre has been so strictly defined by one of their competitors. It in not Enix’s fault Dragon Quest is the game to emulate, but it is other designers’ faults that so many clones have been created. Now I will comfort myself by looking at the final battle in Miracle Warriors. I can assure you that for an eight year old, it was quite a treat. Right on! Haha…I havent leveled up so much in years. It was refreshing playing this one again. Miracle Warriors…*Sniffle* I miss the old days. I played this game more times than I played pretty much any RPG back then, and even now when I think about it. Those were wonderful times. Though I do have one complaint. If the Dark Lord is a woman, doesn’t that make her a kind of "Dark Mother" or something? Hehhe, Anyway This was one of my all time favorites. I’ve even bought a copy of RPG maker XP because Im thinking of making a Fan Game based on this. In any case, Like Charles says – It was indeed refreshing to play this old timer again. Miracle Warriors is awesome. I’m creating a remake of this fine game soon.